For Anabel Vázquez and María Martínez taking care of their looks has become a fun, playful ritual in which they try out different creams, shampoos, masks, lipsticks and balms. They love to discover great little brands in Manhattan or the English countryside, seek out the stories behind each of them and share them with as many people as they can! That is why they created Laconicum, a shop where they sell extraordinary products made by the fascinating brands they discover on their travels. Ultracosmetics presents a practical (and slightly unorthodox) way of understanding cosmetics that is more relaxed and experience-based than scientific. 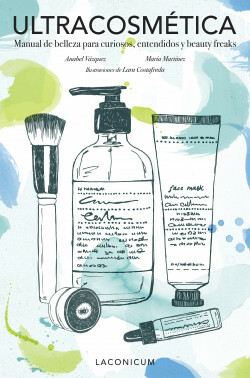 This book offers a comprehensive guide to make-up, a tour through the world of cosmetics and a Green Glossary of eco products.